"If only the Titanic had these on." Rocky Road's Equator Rock Sliders are the creme' de la creme' of the rocker protection world. We use 3/16" inner hitch steel to make sure your bars do NOT bend! Anything other than hitch steel is just plain flimsy. Rocky Road equipped Equator with Supersliders. All other kits on the market are just show bars, or 'steps' and made from thin 1/8" wall or thinner material. They're often referred to as Nerf bars. an appropriate name since they will ofer about as much protection to your vehicle as a Nerf toy product would. 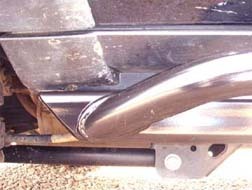 Our Suzuki Equator Rock Slider kits have a very sleek rounded look about them as we use genuine inner hitch steel in their construction. Hitch steel is not only very strong, it also has a nice radius corner instead of a hard boxy look. Inner hitch steel is the stuff you use to plug into 2" receiver hitches. Its sheer weight is astronomical as is its bending strength. Our shop press goes to 50 tons and we can't even start to bend them. Do you think a scrawny little rock can hurt these things? Think again! Why hitch steel? Why not go with a lesser gauge steel to save production costs? 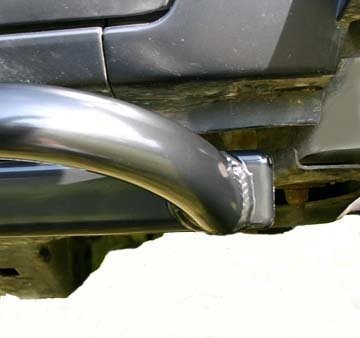 Because we wouldn't trust anything less to protect our 4WD's and neither should you! Besides, since these carry the Rocky Road **lifetime guarantee**, we don't want to have to replace them for you for free every couple years or so. We made them indestructible so they'll last forever and they are guaranteed forever, NEVER to bend on you! Superslider rockrail shot from side angle. Notice the excellent side protection against trail damage, car doors, etc.! Our Equator Rockrail and Superslider kits are very simple to install and are completely 'bolt on'. 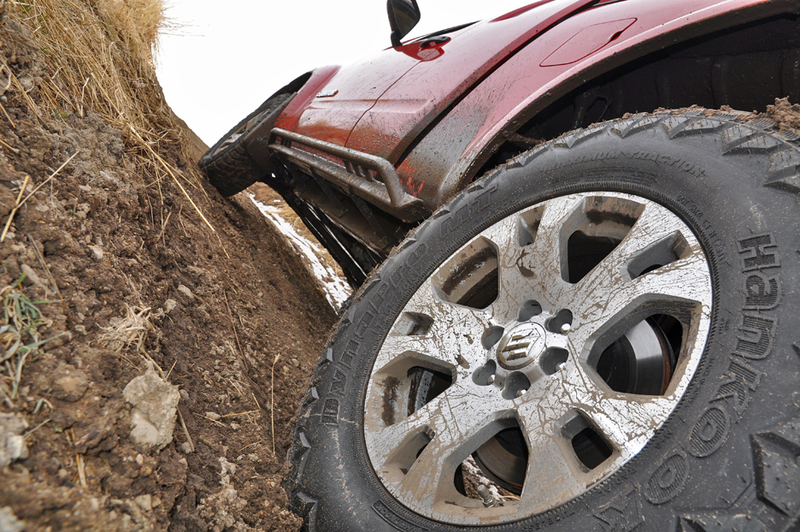 Our Rock Sliders mount directly to the factory bolt holes so no drilling is required. Rocky Road Suzuki Equator Rock Slider kits also feature our Super Slider design which is the second outer slider tube for extra protection from the side AND a great step for accessing roofracks and such. This tubing is made from 100% DOM and is strong beyond belief. 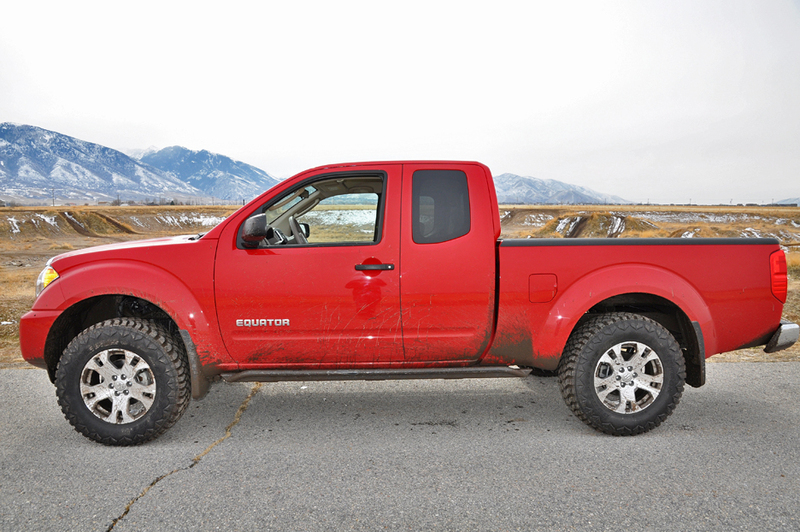 You'll find our Rock Sliders very attractive and will blend in nicely with your stock flares, mudflaps, and moldings. We tuck them very tight to the body to minimize the possibility of getting hung up. 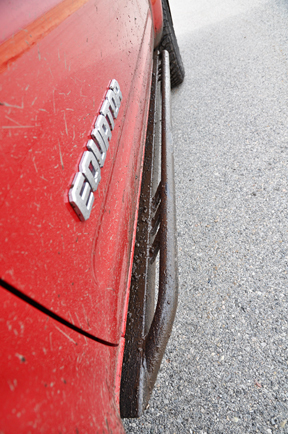 Suzuki Equator Rock Sliders, best engineered! Pictured at left is an example of an engineering detail of the Rocky Road Rock Sliders kits over others on the market. This just helps demonstrates one of the many superior engineering points in our system. Now take a look at the lower picture at left. This is from a competitor. We have lower prices, yet they still cut their production costs by making the end a blunt square. Run that thing into a rock and you can clearly see the trouble you will face. Its a battering ram, not a rock slider. It could stop your vehicle cold or require you to bash away until something gives. Why would they build their kits with this engineering defect? Simple... its cheaper to manufacture with the flat end, so that's what they go with. This is one easily observed engineering advantages the Rocky Road kit offers... but there are many more. The extra slider tube up top on our kits also offers additional side protection on the trail and off the trail. Can be used as a jack pooint for Hilift, also makes a nice step up to the truck. Excellent protection for on and off-road! 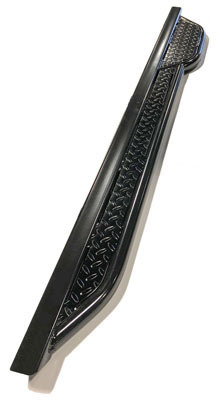 One of our favorite uses of the Superslider is as a bash guard against other swinging doors in a parking. Imagine the dismay of the chump who just threw open his car door only to whack it on the solid steel of your Superslider. He just stuck a nice dent in the edge of his door, your toy still looks cherry! Kicker Rock Slider kit pictured at right. Great protection, Excellent for use as a step. Notice the Diamond Plate rear. All kits come in a sturdy, durable, and very attractive black powdercoat electrostatic and baked powdercoat finish. 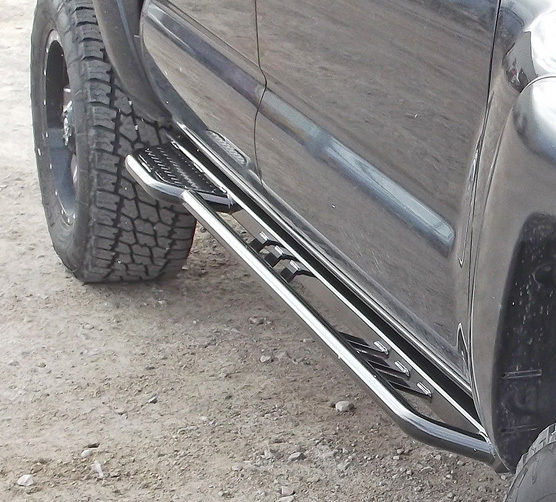 Rocky Road Equator Rock Sliders are simply the strongest, thickest, and most protective bars on the market, with best mounting system, and are guaranteed NEVER to bend. You read correctly, these come with a lifetime guarantee to never bend or dent. No other rock slider on the market would, or could dare make this offer. In a nutshell, if you want the very best, you have found it. Awesome looks, unbeatable protection, SUPER easy installation... no brainer!